AURORA ALERT: Did you miss the Northern Lights? Next time get a wake-up call: Spaceweather PHONE. VENUS HAS A SIDEKICK: Look east just before dawn on Sunday morning, Sept. 20th. There's Venus, as usual, shining through the rosy glow of sunrise. A pair of binoculars trained on Venus reveals a temporary sidekick: 1st-magnitude star Regulus less than 0.5o away. Don't miss it: sky map. The tangle of hot, magnetized plasma circled above almost certainly overlies a large new-cycle sunspot. We'll soon find out. 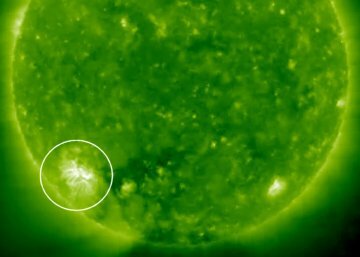 The sun's rotation is turning the active region toward Earth and it could pop over the sun's eastern limb as early as Sept. 21st. Readers with solar telescopes are encouraged to monitor developments. Claude Duplessis took the picture at daybreak on Sept. 17th. "I spent the night in La Vérendrye Wildlife Reserve in Québec," he says. "In the morning, as I prepared to leave, this white 'bow popped out of the mist." Fogbows are close cousins of rainbows. The difference is droplet size. Rainbows appear when sunlight bounces in and out of large raindrops. The same type of reflection produces a fogbow, except fog droplets are much smaller. Small droplets don't separate the colors of sunlight as widely as large raindrops do. 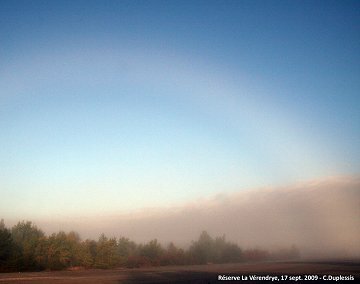 In a fogbow, therefore, the colors are smeared together, producing a ghostly-white arc. To see a fogbow on a misty autumn morning, face away from the rising sun and look into the fog. The lower the sun, the higher the arc, so wake up early for best results! Potentially Hazardous Asteroids (PHAs) are space rocks larger than approximately 100m that can come closer to Earth than 0.05 AU. None of the known PHAs is on a collision course with our planet, although astronomers are finding new ones all the time. On September 19, 2009 there were 1073 potentially hazardous asteroids. Notes: LD means "Lunar Distance." 1 LD = 384,401 km, the distance between Earth and the Moon. 1 LD also equals 0.00256 AU. MAG is the visual magnitude of the asteroid on the date of closest approach. The first place to look for information about sundogs, pillars, rainbows and related phenomena. Realtime and archival images of the Sun from SOHO. ©2008, SpaceWeather.com -- This site is penned daily by Dr. Tony Phillips. ©2013 Spaceweather.com. All rights reserved.